Posted by admin in activity reports, Africa, Congo (Dem. Rep.), eruptions, Nyamuragira. 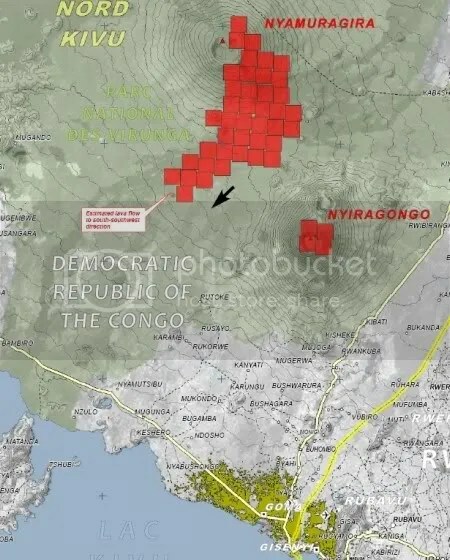 Little fresh news is coming from Africa about the eruption of Nyamuragira volcano in the Democratic Republic of Congo that began two weeks ago, but satellite data indicates that the activity is continuing. 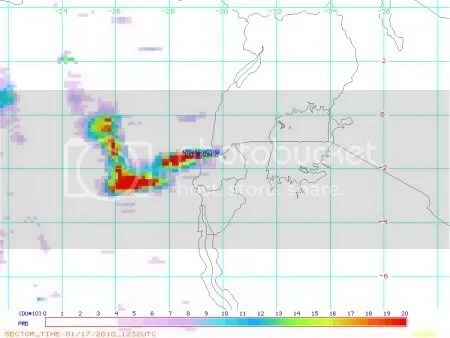 The availability of MODIS hotspot data is affected by cloud cover, which has been considerable in the area of the volcano over recent days. However, MODIS images for 13 and 15 January shows the thermal signatures of fresh lava emissions to the east and south of Nyamuragira’s summit crater. MODIS hotspots at Nyamuragira volcano, D. R. Congo, 13 and 15 January 2010. 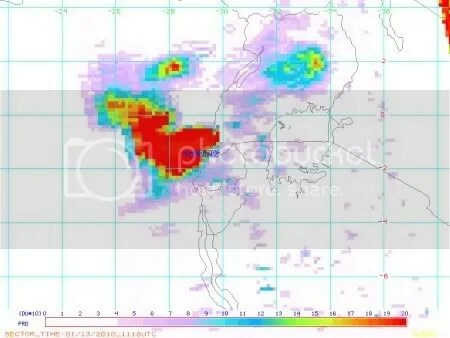 The volcano has also been emitting considerable quantities of sulphur dioxide, as shown by OMI SO2 data. 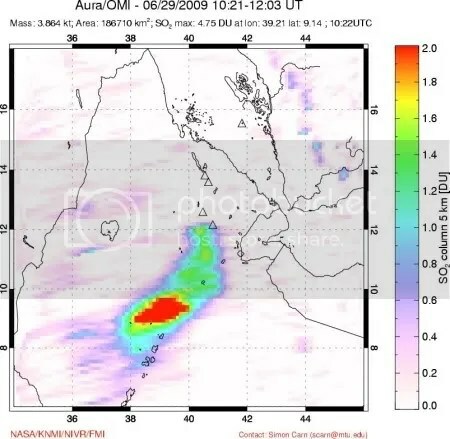 Significant SO2 clouds were detected on 13 and 17 January 2010. Nyamuragira, D. R. Congo – OMI SO2 composite image 13 January 2010. Nyamuragira, D. R. Congo – OMI SO2 composite image 17 January 2010. For all our Nyamuragira coverage: Nyamuragira « The Volcanism Blog. The latest information on the eruption of Nyamuragira volcano in the Democratic Republic of Congo comes from Samantha Newport, director of communications for Virunga National Park, who reports in a comment at the gorilla.cd blog dated 11 January 2010 that lava fountains were reaching almost 300 metres in height on Saturday 9 January, but that volcanic activity had since diminished. The decline in activity appears to be confirmed by the fact that no thermal hotspots have been detected by MODIS at Nyamuragira since 8 January 2010 (although that doesn’t mean nothing has been happening). 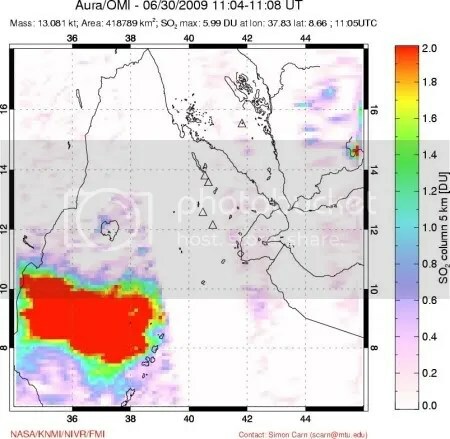 The image above, from UNOSAT (original PDF document here), shows thermal anomalies on the eastern and southern flanks of Nyamuragira volcano detected by the Aqua satellite’s MODIS on 4 January 2010. Source: Reuters Alertnet. Five days after it began the eruption of Nyamuragira volcano in the Democratic Republic of Congo is continuing, with fire fountains and very liquid and free-flowing lava. The images above, compiled from the University of Hawaii MODIS hotspots monitoring website, show the thermal signatures detected by satellite on 2, 3, 4 and 6 January 2010 (the 5 January image shows no hotspots). The flows are directed towards the south-west. The large lake is Lake Kivu, and the small body of water to its north-west is the Gulf of Kabuno. The high level of CO2 present in the Gulf of Kabuno is a potential hazard we discussed here yesterday. The most up-to-date information on the eruption comes from the people on the spot at the Virunga National Park: an entry dated 5 January at the gorillacd blog (including dramatic aerial photographs) reports that lava had travelled 21 km from the vent, but a comment on that entry dated 7 January updates this with information from the UN to say that the advance of the lava has slowed, with only 100 metres of advance in the last 24 hours, not because the eruption rate has slowed – the activity of the volcano remains intense – but because the lava front has widened from 15 metres to about 200 metres. More news and links to sources of information for this eruption can be found at OpEdNews: ‘Congo volcano still active’. ‘The Virunga National Park, home to 200 of the world’s 720 mountain gorillas, is in the path of molten hot lava spewing from a volcano that has erupted in the eastern Democratic Republic of Congo’, reports redOrbit (lava that is molten and hot is recognized by volcanologists as the worst kind). The New Zealand Herald observes that the park is ‘home to a spectacular range of mega fauna’ and reports that ‘the eruption has been “very destructive” to the chimpanzee range’ – and also says that Nyamuragira is ‘believed to be the most active volcano in the world’. If so, this is an erroneous belief. ITN reports that ash is contaminating local water supplies, leading to an increase in local people suffering cholera and diarrhoea. The New Scientist has chosen to headline its report on the Nyamuragira eruption ‘Troops protect chimps from volcano lava’, which conjures up some weird images but is in fact a reference to the United Nations force in Congo (MONUC) offering to lend aircraft to the park authorities to help them monitor the progress of the eruption and – as far as possible – protect the park’s population of endangered chimpanzees from its effects. The eruption of Nyamuragira volcano (also known as Nyamulagira) in the Democratic Republic of Congo which began early on 2 January is continuing and seems to be increasing in intensity, raising concerns about local human and animal populations. Lava flows are causing forest fires around the volcano and some reports say nearby villages are threatened by the eruption. The United Nations is providing aircraft to help the local authorities monitor the eruption. There are some reports that the emission of lava is accelerating. The BBC and NTV Kenya have some spectacular video footage of the eruption, including dramatic lava fountaining (the NTV video is also available at YouTube). Nyamuragira’s lava is of very low viscosity – Eruptions explains why – and can run a long way (tens of kilometres) from the active vent. The large lake Kivu, which has a lot of methane, does not represent too much danger, but there is a small lake called the Gulf of Kabuno in which there is more CO2 than methane. Evidently, the situation is not yet at the stage of saturation but many researchers along with ourselves think that we are not far from this situation of saturation. If the flow of lava continues and it empties into the peninsula of Kabuno, and this small lake beside the large lake Kivu, this could lead to explosions if it approaches saturation. An estimated three cubic kilometres of carbon dioxide lie just 12 metres below the surface of the gulf, which sits atop a tectonic faultline. Scientists fear a major earthquake or large lava flow from a nearby volcano could provoke a giant release of gas, creating a deadly cloud. Katcho Karumé told Radio France International that this is not an imminent threat: only after ‘around 17 days of sustained emission of lava’ would there be a danger of the lava reaching the Gulf of Kabuno. However, as noted above, Nyamuragira’s lavas run very freely and have the potential to reach very far. UPDATE. Interesting articles about Nyamuragira at Greg Laden’s blog: ‘The Volcano Nyamuragira: Some Context’ and ‘Nyamulagira Volcano and Human Evolution’. Wildlife officials in the Democratic Republic of Congo are reporting an eruption of Nyamuragira volcano in the early hours of Saturday 2 January 2010. Congolese Wildlife Authority rangers in Virunga National Park reported hearing a loud explosion at 03:45 local time (01:45 UTC), and seeing lava flowing from Nyamuragira’s crater. The lava is reported to be flowing southward, towards areas of human habitation. The eruption may also threaten local wildlife, including populations of rare chimpanzees. Nyamuragira volcano in the Democratic Republic of Congo is reported to have erupted on Monday 19 October. Lava flowed northwards, away from the town of Goma which is to the south of Nyamuragira’s southern neighbour, Nyiragongo. There are no reports of casualties or any disruption, but the area has been the scene of fighting between the DR Congolese army and rebels, and local relief agencies are concerned that further eruptive activity could prevent them getting help to where it’s needed. UPDATE. The volcano-watchers at Activolcans have been checking thermal anomalies at Nyamuragira/Nyiragongo and have left a comment below which raises a cautionary note: this may not have been an eruption of Nyamuragira. Posted by admin in activity reports, Africa, eruptions, Ethiopia, Manda Hararo. The first on-the-ground reports from the location of the recent eruption in the Manda Hararo volcanic field in Ethiopia have come from David Ferguson, a doctoral student in geology at the University of Oxford. He is reporting on his work on the volcanics of the Afar region in a series of blog postings for The Guardian. As we reached the front of the lava flow one of our group, Dr Elias Lewi, walked out over its brittle surface, quickly turning back as his shoes begin to melt. Although only a few days old, the lava had a dark black crust and was deceptively similar to other, much colder flows. The real temperature was revealed by Talfan Barnie, a PhD student from Cambridge, who used a thermal infra-red camera to ‘see’ temperatures of up to 162C around the cracks and fractures across the flow surface. We had to be very careful where we trod. David Ferguson reports extensive (~10 square km) fresh lava flows from the eruption, about 3 m high at the margins, gas emissions, and a 5-kilometre fissure and central vent producing a small plume. There is more on Manda Hararo in the Global Volcanism Program’s Weekly Volcanic Activity Report for 1-7 July.